The cool air blows my hair into my face as I push off the canyon wall with my feet. The rope sliding through my hand, I land back on the rock with a small jolt. Relaxing back into the harness, gravity takes control and I “sit” to look around. The slot canyon is surrounded on all sides by red rock walls. These canyons are narrow, and made by the wear of water running through them. The canyon floor is dirt, about 40 yards long and 2 to 5 yards wide. I see a small path that must lead to our next rappel. 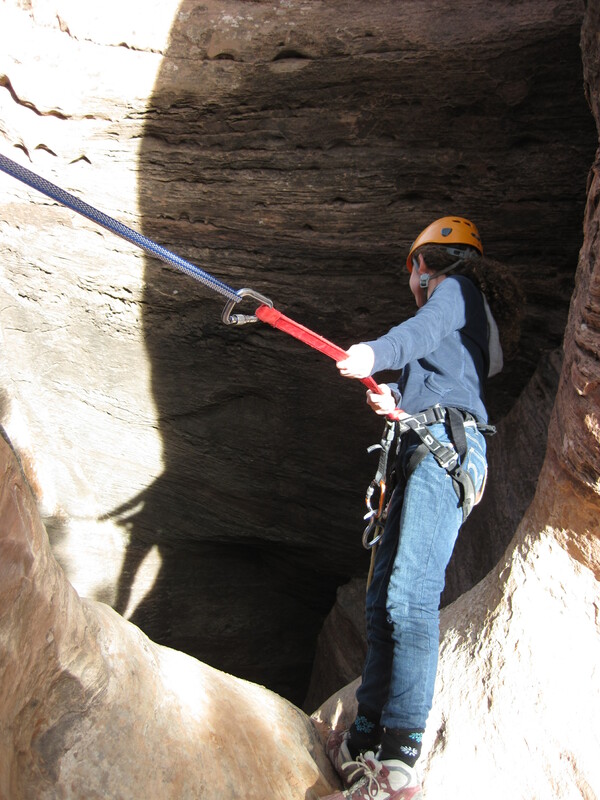 Gripping the rope behind me to control my descent, I take off again for the bottom of the wall, 100 feet below me. A few more big jumps and I’m down. That is so much fun! 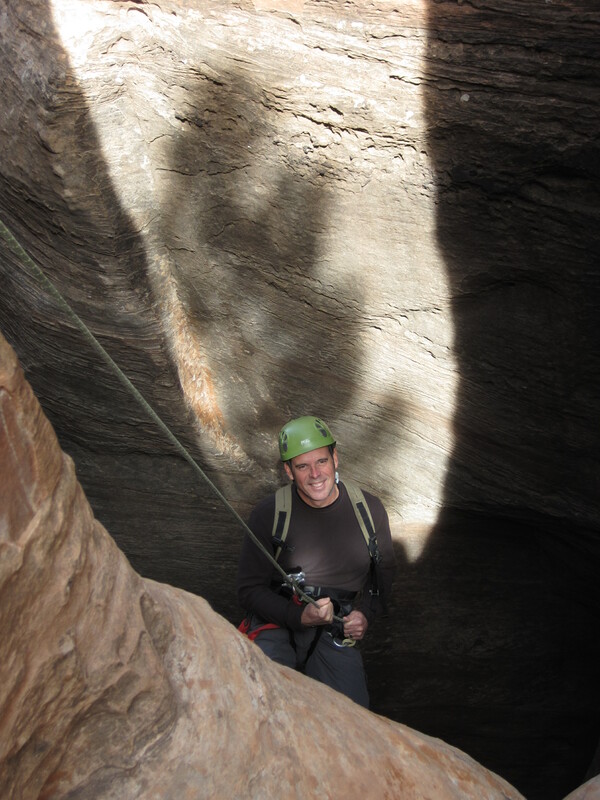 Rafael, Rachel and I are canyoneering and repelling in Zion National Park, Utah and we love it! Our adventure starts with a scramble up the rocks, searching for hand and foot holds. The red rock is fairly smooth, making the climbs a little bit challenging. At the top, our guide teaches us everything we need to know to enjoy our day rappelling. We practice the techniques on a small, 50 foot wall until we are confident. Then the fun really starts. 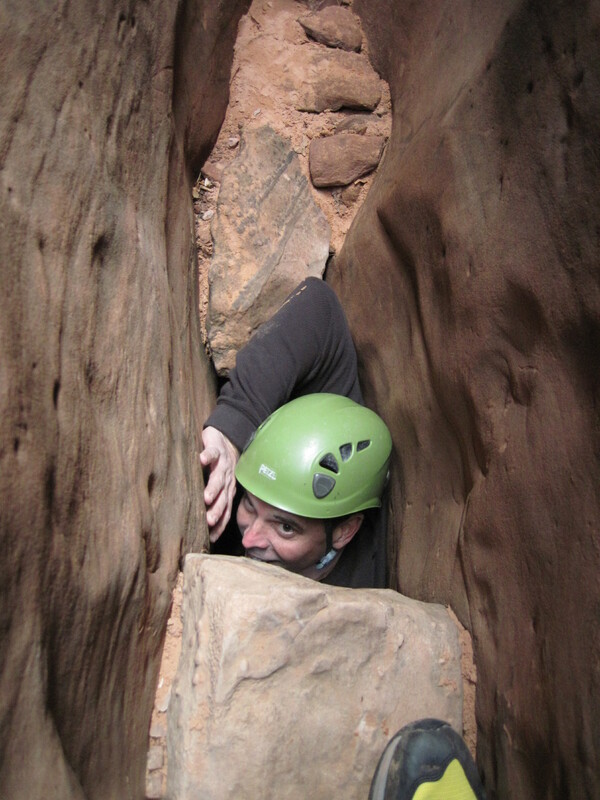 Squeezing through a narrow crevice in the slot canyon, we look out at the amazing view of rocks, canyon and bright blue sky. Rachel, attached to the anchor on the wall, leans way out to see the bottom of the cliff we are on. I love her courage. You have to trust the equipment! She scurries over the side and disappears from sight, rappelling the wall. 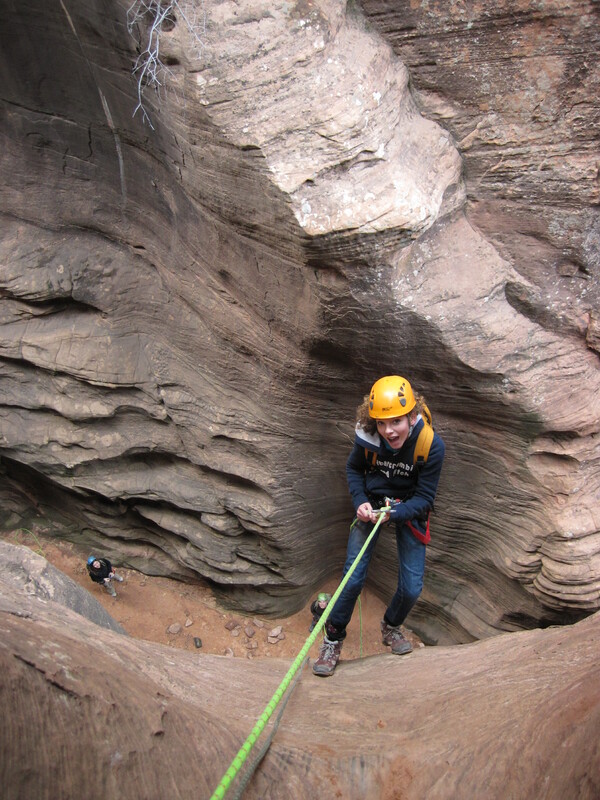 Our guide takes us to higher and higher rappels because we are enjoying them so much. 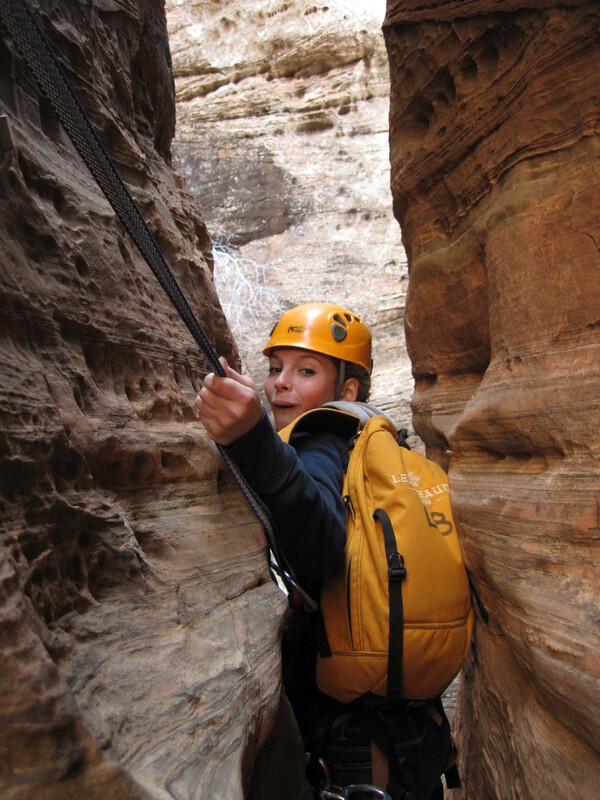 Our last climb takes us to a slot canyon where we have choices on how to descend. If we go down low, we could walk and climb over the rocks on the canyon floor. Rafael and Rachel choose this route. The guide shows me another way, which is to use my back and feet to slowly inch my way across. Using the strength in my legs, I push them against the rock and lean my back against the wall. I’m high enough off the ground that it is a little harrowing when I get tired about three quarters of the way through. Pushing on, I make it to the other side and feel a great sense of accomplishment! After this adventure is done, we walk out with our guide to our car. After such an amazing morning, we are ready to conquer some difficult trails for the afternoon. Angels Landing, here we come! Courage Level: 4 This is not for someone afraid of heights. The key is to trust that the equipment will hold you. If you do not think that you can manage that, this may not be a great way to spend your day! Fitness Level: 3 Canyoneering is not that physically taxing (unless you decide to go through the last slot canyon the way I did!) My Mother, who is in her seventies, managed to do this adventure with some minor assistance from the guide. As always, a shock proof camera is great for a trip like this. We use our Olympus Tough, which I often carry around my wrist, letting it bang into the rocks. Our trip was in November, which is a great time because there are fewer people in the Park, and it is not too warm to do hiking and other strenuous activities. 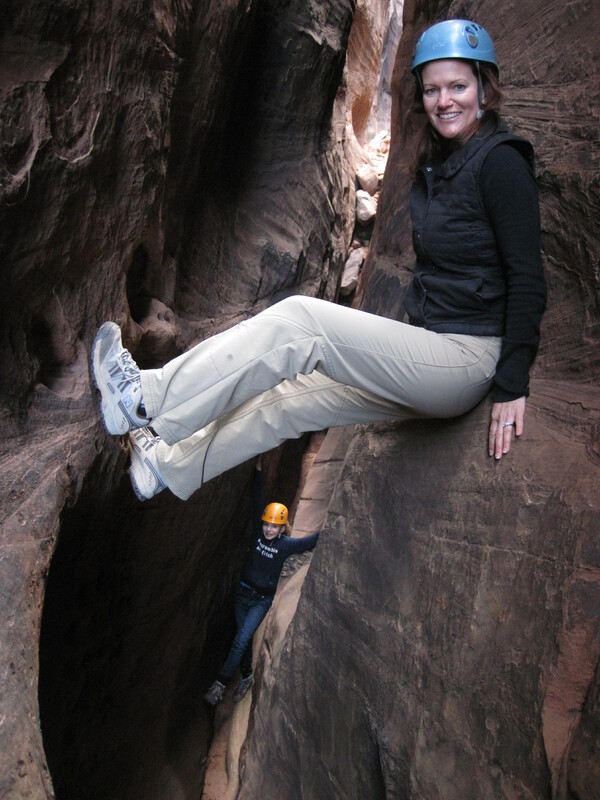 Just wear layers, because you will heat up as you are climbing and cool off when you are rappelling. We have collapsible water bottles that we refill. They’re great for travel and you are not hurting the environment with single use water bottles. Make sure you have enough water with you, as well as a snack. Your 70 year old mom did this?????? Impressive. She did! I have trouble keeping up with my parents; they are incredibly active.